The church: Sweetest Heart of Mary, Detroit, Michigan, USA. 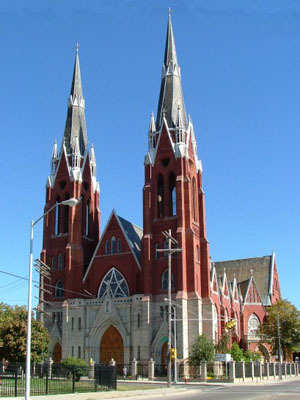 The building: Built by Polish immigrants in 1889, Sweetest Heart is the largest church in the archdiocese with about twice the seating of the cathedral. 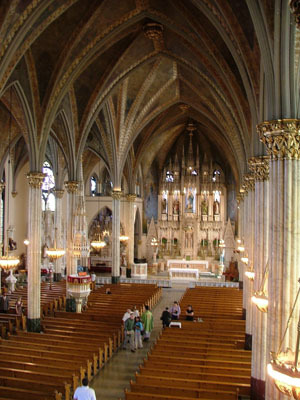 A highly-decorated Gothic revival whopper of a building, it is in remarkably good condition, from its twin spires, 217 feet high, to the old wood pews which originally seated 3,000. The church: The parish is now one of a cluster of three similarly huge old parish church buildings in the inner city, each with a handful of parishoners, and all sharing one priest. As the chief (but by no means only) parish of the Polish community, some of the current parishoners are Polish Americans with historic ties to the parish (even though they may live in far-flung suburbs). Others are locals of various ethnicities, and as with any remarkable church building, there are always "tourist-worshippers," as we were. The neighbourhood: As the world knows, central Detroit is emblematic of racial issues: white flight to the suburbs followed by middle-class flight, de-population, tear-downs of vast amounts of the housing stock, various renewal efforts, and (most recently) a discernable revitalization. Sweetest Heart is surrounded by a few older homes, other large churches (made more visable by the open blocks of grass where those Polish immigrants used to live), and some new town-house development. The cast: Fr Mark Borowski, pastor; Michael Covatch, organist. Twenty-sixth Sunday in ordinary time, 10.30am mass. About 10 per cent, which actually didn't feel empty at all. That's about 250 people in a church that, even with a few of the rear pews removed, still seats at least 2,500. At one time the parish had 7,000 families! There were greeters handing out the paperback missalette, and the parish newsletter (not really a service sheet). A hushed good morning was spoken, but as the procession was already formed up in the narthex, we arrived just in time. No, but given the age and size of the building and the drop in attendance, one wouldn't expect cushy new pews. The kneelers were a bit of a problem, but by folding down the one behind me, I was able to kneel satisfactorily. If the parish gets the money, they could respace the pews front-to-back, and refinish the wood floors to good effect. It was hushed and prayerful by the time we got there, but the organ prelude had started, so earlier on it may have been chatty. "Good morning. Praise be to our Lord Jesus Christ!" Their organ (Austin opus 2, for you organ-buffs) was played and it sounded fine in the huge reverberant interior. It is a small instrument (restored in 1987) and adequate for hymn playing, but a recital would be a challenge. It's great that this instrument has survived the vicissitudes of time. What didn't distract me? It's quite an interior, and one can only imagine the generations of young minds wandering during the Latin mass; staring up at the acres of stained glass, countless canopied niches with plaster saints, and the subtly polychromed vaults. The mass was a typical minimally-staffed contemporary rite. It would seem a bit perfunctory to a high-church Episcopal type. 12 minutes. Mindful that he has a 12.00am mass three blocks away (at another of the parishes in the cluster), Fr Borowski kept things moving out of practical necessity. 6  Fr Borowski gave the sermon "Oprah-style," walking dramatically around the center aisle. Too bad the ornately painted, gilt and canopied pulpit was not used. The sermon started out as a commercial for the building, and proceeded mixing pitches for upcoming events into the message. He segued into the windows and statuary as instructing us in our faith; and did eventually tie it into the Gospel reading about the Rich man and Lazarus. It wasn't a homily that would be likely to quicken you or I in our faith, but it communicated his good nature, enthusiasm for the parish cluster, and was inclusive and welcoming to the visitors. Really not a bad job for a typically overworked Catholic parish priest these days. The whole building interior is meant to represent being in heaven, and who am I to argue with that? The service was attended by a nice cross section of ages and ethnicities, which I take to be a good sign. The paperback monthly missal is an awful thing, and Catholics will never take to congregational singing and participation while these are in use. Having no service sheet assumes you know what will be sung or said next, which isn't ideal either. There was a Polish hymn, which only a couple of people other than the organist seemed to know, and it wasn't printed. Driving through this part of Detroit, the devastation caused by white (and middle-class black) flight, from what must have been a nice neighborhood, still hits you like a body blow if you aren't used to it. We acted the tourists we were, and were greeted by ushers again. Going up to the loft we chatted with the organist for a bit. I took some pictures and admired the side altars at greater length. Eventually doors were being locked. There was none. The announcements included a dizzying litany of dinners, festivals and special masses coming up in the next month, including an added 9.30am Sunday Tridentine Latin mass just for the month of October. So lacking a coffee hour, there are certainly many social opportunities for a newcomer to meet other parishioners. 6  If I lived here it would be a possibility, but lacking the proximity and the Polish heritage, it is not so likely. Sure. One is very aware of urban history and European immigration in a setting like this. The continuity of the faith and response to urban conditions is mostly an uplifting message. The amazing building (probably mostly unrestored, and not in bad shape for that). I will try to forget the monthly missalettes.